We are happy to inform you we've just claimed eSteem.app domain in the new .app zone by Google. Our old esteem.ws will redirect to new domain and gradually we will make most use of it. For this occasion of obtained new domain name, we want to celebrate it together with a small contest. All you have to do is visit our new home page and write a comment on this post what is the most useful feature you like in eSteem application and what is the most expected one you are missing there? Few most valuable and few random commenters will be nicely rewarded. We have a lot of exciting and great news for you! Stay tuned! I like the Activity manager a lot because it's nice and clean. Thank you for your comment! Are there any features missing for you? Well it's good if you guys can add the "Post Notification" feature like we have in @exyle 's application. Push notification for your favorite authors? Great idea! Thanks a lot for your suggestion! Thanks, actually i already suggested this feature 3-4 months ago to @good-karma but got no response, i hope this time they add this. For me the best thing is the possibility to handle different accounts in one app. It's awesome to see great apps thriving on this blockchain. Regarding what I like most about esteem is the fact it you can schedule posts, I think most front ends should have this implemented in one form or another. What I would like to see in the future is better integration of video and images so that thumbnails are actually displayed in the feed so the message that there is no thumbnail shouldn't appear without it being the case. Also I would love to see a tipping mechanism like dlive has implemented in order to reward valuable old post post. 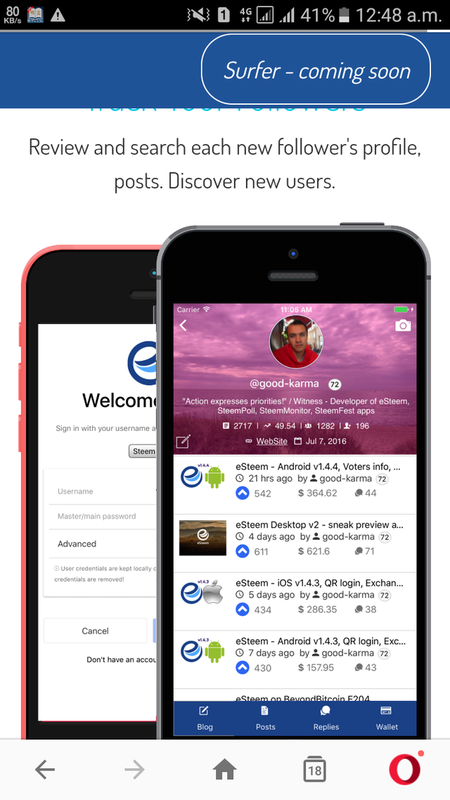 for me, esteem app is the easiest way to use because all features are very friendly to compare to steemit site. i like one thing too much is its auto save post feature because many time suddenly closes by press back button then it will not be lost what we write there. i do not use steemit site for post from a long time but before many time it not save like esteem and i dont know about it. its easy to upload photo from app rather then site because that feature is easy and all can do it. it also give notifications which we would like according to our choice so it notifiy us which we want. we can also vote according to our percentage which not possible in site till reach certain SP in site so its a good and easy feature for all. i wish one day block option comes so that if we block someone then they cant comment on our post or comment or can mention us and i am waiting for that feature otherwise everything is perfect in app and i give it 100/100 marks. Thank you for using esteem and give feedback! I have no computer with me so all that I do on steemit is through my mobile phone. Esteem app is really helpful for me in creating contents and keeping them scheduled if I want to. And also it allows me to select the voting power even as I have much less than 100 SP. One more thing I like is I get votes from @esteemapp and @good-karma at times just for posting something through this app and using the #esteem the tag. And some cons are there that need to get addressed. If I write very lengthy articles and there are some edits needed to be done, I will scroll up/down in the editing bar to locate the exact place where edit has to be applied. But what happens is the cursor won't exactly drop in the actual place when I tap. It appears at the point where it has been when I left the edit bar before. Busy.org and Steemit.com are doing great here. So at times I switch to busy if the article is very lengthy. I hope you will fix this so that I can consistently use esteem app. Hope you will reply to this comment. Thanks. I love being able to select favorites and think the app is quite complete. I have all the features that I need! Thanks so much! Congratulations on the new domain @good-karma, home page looks fantastic too! 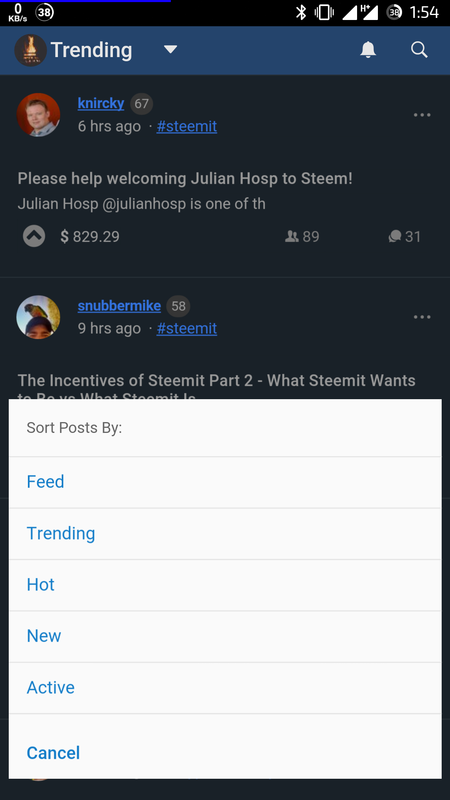 Regarding the eSteem app; it has given me so much more control and visibility over my account that I (and others) have been drastically missing on the Steemit web page. Personally I really value the more obvious features like mentions, votes and following notifications, but I also really appreciate the small things like the streamlined 'home' and 'profile' navigation. Also the easy to use feature on someone else's profile to discover their comments, relies and wallet. I'd like to see some bug fixes on the back button on the 'reply' tabs. It seems to freeze - but shutting the app seems to solve it. This also means my written comment might be lost if it crashes before I hit post. It was also a pleasure to make the video of @dunsky presentation at the London Crypto Show! A great platform to talk about your work. Thank you for your meaningful valuble feedback, Ash! I like esteem posting and transferring system but if its homepage will my profile than it will be more nice. Do you mean you want web application with an ability to open your profile at esteem.app/@yourusername? Thank you @good-karma you have created this esteem application. Moreover, this latest application. Sengan sophistication can vote 1% or up to 100%. You are great, you have made the economy better. For the 6 months that i am using the app i can say that there is a big improvement in the quality, speed and UI. 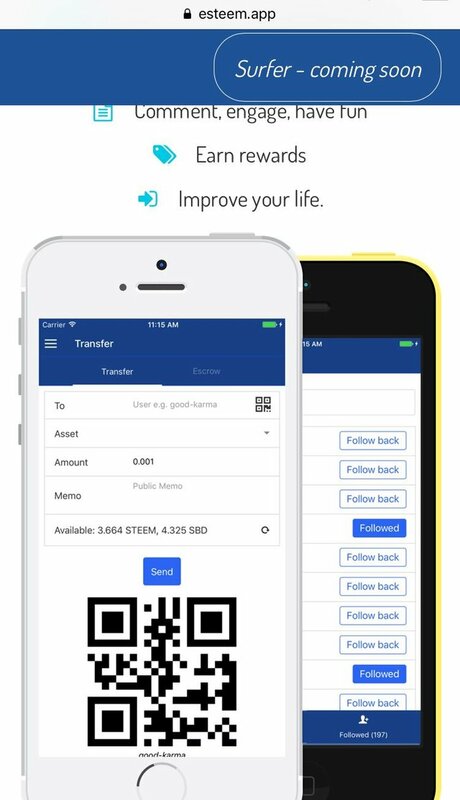 Great work of the E-steem guys. Keep it up ! Thank you good-karma you have created this esteem application. Moreover, this latest application. Sengan sophistication can vote 1% or up to 100%. You are great, you have made the economy better. Thank you very much good-karma, the information I got tonight is quite useful for me, for me all the published projects are quite useful for newcomers, discord esteem is also a convenience for me as a small fish to get the bait. Good program. I hope eSteem.app succsess to domain in the new. 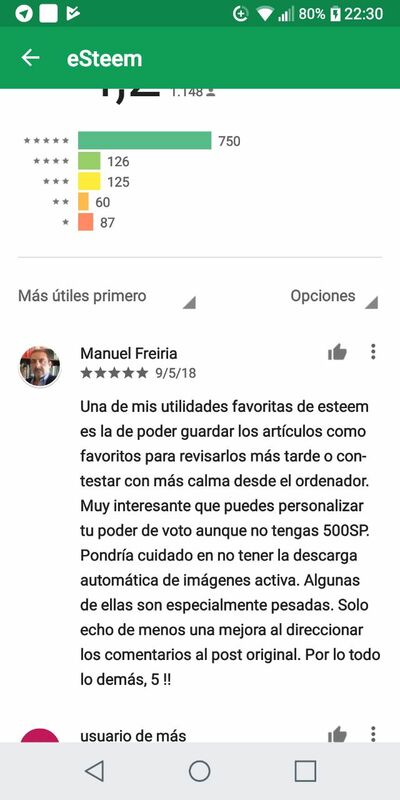 App zone by google. its a great news for all steemian..
a real contribution from the @esteem app, I thank the @good-karma and colleagues who have taken pains in managing an app just for all of us. Thank you @good-karma for creating this useful app esteem. Very very useful. Great information, I love #esteem. Thats great effort by you. Its gonna be marvellous. Ok I 'll visit. Just visited. Its awesome and many people will download it and yes I like your slogan "We are different"
I am a loyal user of esteem and I always support every policy that is in esteem. Now app esteem is increasingly innovating and evolving so it offers convenience to its users. There are many things I love about apps esteem and the ones inside of them, in terms of the latest features and unobtrusive look, especially easy to recognize other users as it shows clear profile photos, as well as instant addressing of user addresses. Respect your work and your work that satisfy me. Thanks for share it @good-karma. Hi @good-karma I really like to use #esteem application. almost all my posts using #esteem. I really appreciate the upvote from you and your time. because it is very helpful to my economy. I am an unemployed person. Aplikasi eSteem app ini memiliki kemudahan dalam menjelajah berbagai sumber informasi. Semoga dengan kehadiran aplikasi eSteem app ini bisa menambah wawasan bagi pengguna aplikasi ini. Saya sangat senang dengan keberhasilan @good-karma dan timnya dalam membuat aplikasi eSteem app terbaru untuk memudahkan para steemians dalam menuliskan postingan. Dan fitur-fitur didalam aplikasi ini saya rasa sangat lengkap. Penggunaan nya pun sangat efisien. Saya rasa aplikasi eSteem yang terbaik.. Thank you @ good-Karma, with applications esteem, we will all easy in play steemit, and we will always be waiting for renewal esteem, the and hope my future hopefully in renewal application to be more perfect again with the view more modern so that the user will be more satisfied with this application, success always @ good-Karma, we will always support you, and always been waiting for renewal application. Awesome website! I love that it is easy to post photos on my phone with the eSteem app! Great job. Great update, but to be honest, for some user, it is hard to find log out menu, since it's somewhere in user account, would be better if it's placed in easy to spot. And i can't wait desktop/web version of esteem. You're doing great. 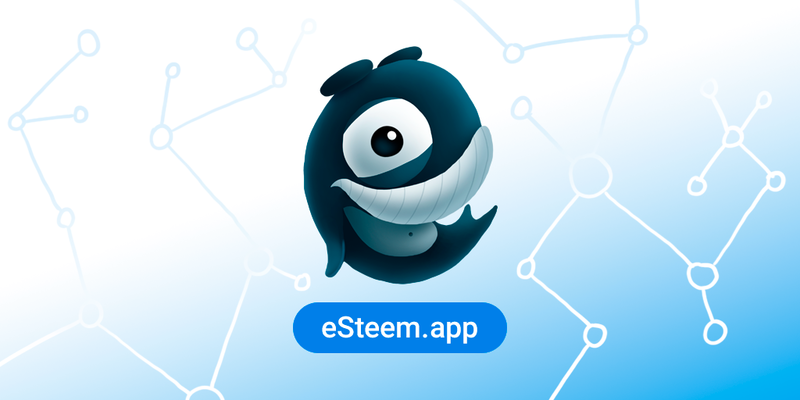 From the first I played steemit, esteem is an application that always creates convenience for the user, this time there donload the image so that sometime if the image is needed, we can take it from esteem. and I hope when entering the image png format is also well supported by esteem so tanpak transparent images seoertinlogo and so forth. thanks for any offerings you doz certainly not easy to keep an application so far. you and your team are the best. Hi, Sir discusses your daily and extraordinary issues, according to him, he wrote a few blog posts for the community that really played a very important role here for the members of the community because the topics you discussed are very important and there are many learning lessons from here. You've talked about an app for this community which is really important because it's a great deal for Android and iso users because they are discussing apps software for them, it will play a very good role. Now that I know about this app, it is really great that the apps I think have analyzed the way you are doing the right way, then it will play a very big role for this community. Sir @good-karma, you are an expert and very important member of this community through your blog that has been a few blog posts for which a community members do not know again you have discussed about it for the last few days. Thank you. 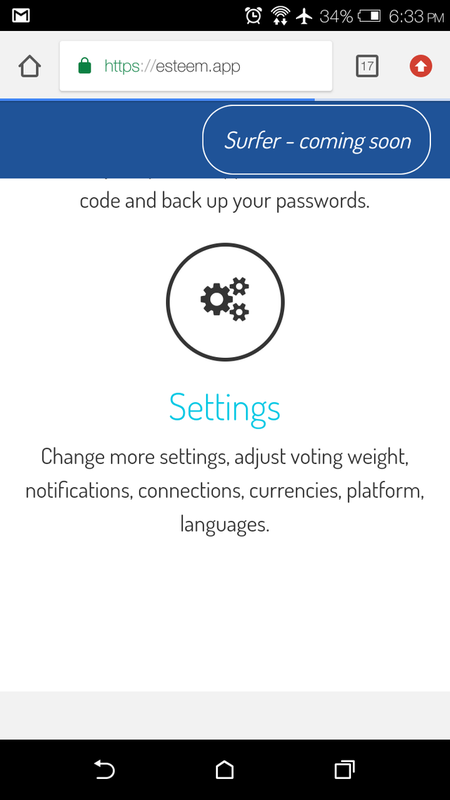 Besides talking about layered security and markdown that works very well on eSteem-App. One thing that makes me to always post via eSteem-App is the power of the server. And so far, I'm very comfortable, ever some time ago when the server Steemit problem but I can still post with via eSteem-App. So, this is awesome. yes good-karma, i like esteem, because esteem app has speed. like, we write, make post edits, and there are still many useful features for lovers of steemias ... hope i esteem be a useful app for us lovers steemit. so we can be more adorable to work in esteem. and my hope again for esteem curators like you, may be the best. i like you, because you are a fair person giving upvote .. i love the way you work . I’ve explored and I love, these features which includes interactions with other users, voting ,commenting , push notifications . 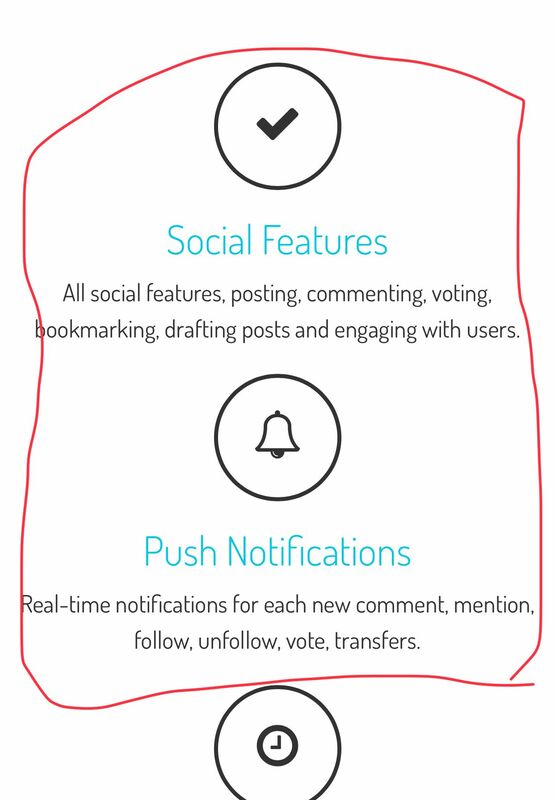 All lovely, but what I’d suggest for the app under notification is options to get notified when a particular follower or following makes a post by being able to favorite them on the app and there would be a kinda favorite list of following and when any of there people makes post you receive a notification for it. Ada hal istimewa yang saya dapat dari esteem, anda dan team selalu setia menjaga aplikasi ini terus berkembang. Saya salut dengan adanya tombol love (favorit dalam aplikasi ini) jadinkita tidak perlu susah payah melihat teman-teman yang memang kita favoritkan. Dear @good-karma has not visited my blog please please upvote @fikar21 thank you. Thank you sir @good-karma, keep the spirit and keep innovating we always support you. this good news good luck and always smoothly. i use esteem every make posting but why i rarely in upvote by @good-karma. the good news, we should try it now thank you for sharing information @good-karma,I Will upvote and restem. What do you mean? The place you are commenting this supposed to be the place for the contest actually. There is no direct link to it. It's just here. 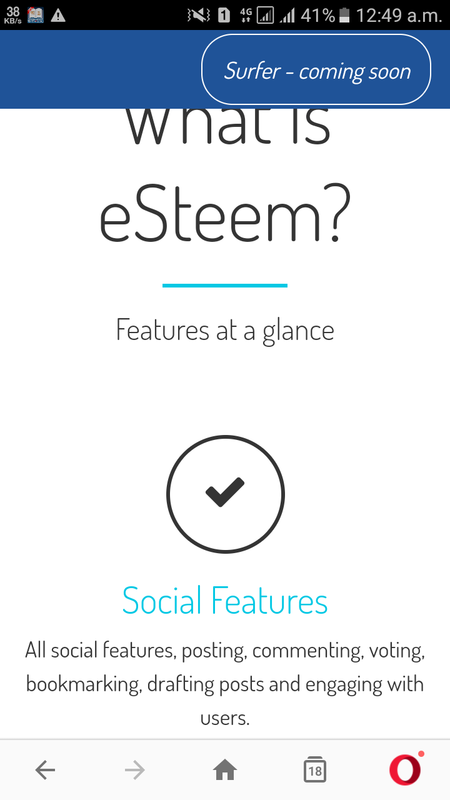 And esteem.app is our new domain name so if you just press it you will see. But you should comment here inside this particular post. I can post so easily with esteem app that's what I like the most about this app. And as a minnow my expectation was to get upvote from esteem which I haven't got yet. Haha That's okay for me. Because I'm still growing still learning. By the way thanks to esteem app for making things easy for me. I am using esteem app but I am not get your upvote. Selamat malam, salam saya dari aceh untuk @good-karma, dari pertama saya mengenal steemit, aplikasi esteem adalah favorit saya tempat untuk menulis, aplikasi ini sangat lengkap dan mudah untuk di gunakan, fitur yang saya senangi adalah mudahnya melakukan postingan dengan format yang lengkap. Selanjutnya aplikasi ini bisa memasukkan beberapa akun steemit dalam satu aplikasi, aplikasi ini sangat bagus, saya mencintainya..
Hiii @good-karma, I am a big fan of you and already Cast My Vote of Witness for you. eSteem.app is amazing addition here and now I am downloading it. its all features are wonderful but i most like its Security because everything is secure here. Thanks for great feedback and using esteem . Are you have join on discord esteem? I think it's easier to post and scroll and I am badly missing some options. you can add some. Saya sangat senang bisa menikmati sebuah aplikasi yang anda kembangkan.yaitu esteem/steemit. Dan saya pun baru pertama kali membuat satu Post untuk memperkenalkan saya kepada kawan-kawan yang ada di steemit. Saya sangat mengharapkan dukungan dari anda tentang Post yang akan saya tayangkan di steemit. i miss the use of eSteem app from my desktop web browser. Though i used it from my smart phone. eSteem app is easy to use. Beneficial to use from smart phone. But in smart phone app it showed a direct login screen, why did not it connect via 'steem connector' ? Waiting for the web version. Thanks for sharing, I was just approved today and can't wait to get started! My hearty congratulations as I use the app quite a bit during travel! I just wrote a post on it sitting in the airline lounge and thought if a great feature for your users... a preformatted signature to make the app even easier. Congrats once again for the great work. No but I will now... lots more travel this year. Not only that, but while steemit figures out there upvote and payout features for posting, it is easier to use eSteem over the PC. By the way how do I clear drafts on the app, do you have a source page to read for using the drafts? Thanks for your great comment and your feedback! Thank you very much. ..... to provide such entertainment .. I worked in steeemit platform for a long but all of my posts was posted on esteem application. Because it is not busy to use like website. Be good, when be acces ini web? I feel the esteem app so much faster and lighter, good jod. The sun has risen and the new day is open again with full features. Start your day with full motivation, @good-karma. Look in the mirror and make sure you are ready to face it all and succeed today and then, I always follow you brother. Thanks @good-karma for your support. Thanks for your information @good-karma. This is awesome. I love using esteem app because i can make a post from my phone. Maybe someday video uploading is also available. Once again, thank you so much.